Discussion in 'DVC Resorts' started by Dano1182, Mar 24, 2019. I was looking at a map of BWV . Are corner rooms any different that regular rooms? We stayed in a dedicated one bedroom in a corner room off of the leisure pool and it had an extra window in the living room facing the canal and Swan/Dolphin. No other differences as far as I could tell. We've stayed in a corner room twice now, you have a wrap around balcony that is nice, you get the same amount of furniture so there is a lot of wasted space. That makes me think of the huge balconies in the village green studios that have only the standard 2 chairs in little tiny table when they good fit numerous lounge chairs. Might have been nice if they had filled in the furniture to match the Room designs. The only corner rooms that are really different, in having the much larger living room/kitchen area, are those noted above and shown in the photos above. Be aware that if you want to try for one, they are in the standard view booking category. I stayed in that room or at least a copy of that room, standard view, down at the end of the hallway. Can't remember the room number. I took my sister with me that trip, she was really impressed. Nice to have a big roomy balcony. I’ve requested one of the rooms that end in *123 everytime I’ve had a 1 bedroom standard over the last 13 years.....one day I might just get my request. But so far I’ve never gotten that room. They're pretty far, but not the farthest. The room down at the verrrrry end of this hallway. Which is the hallway after the hallway that goes to the elevator. We were in the hallway after this hallway. JARNJ3 and AdamsMum like this. There are different viewpoints based on experience. 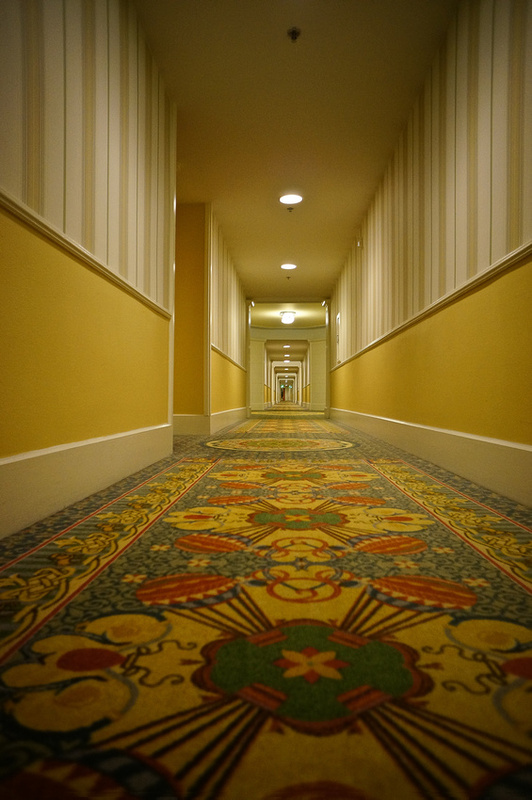 Some believe you have very long walks to rooms near the end of the hallways at BWV, but then some, like me, who also own at AKV and have had a room near the end of the hallway on the north wing of Kidani, now realize that any walk to a room at BWV is just a pleasant short stroll in comparison -- at adult pace it takes about 90 to 100 seconds to walk from the elevator near the lobby to an end room at BWV; at AKV Kidani it takes about 6 minutes. ColinA and AdamsMum like this. You got that right. I was closing on the sale of my house while at Kidani, I was also in the farthest section of the north wing. I had to make the trip to the front desk several times to fax documents. After a couple of trips, my brother offered to drive me to the front desk! I was so relieved. Don't bother getting refillable mugs if you stay there. It's a good thing they let you park under the building at the nearest elevator. Wow! I videotaped a walk from the elevator in BWV to our end villa - I think it was clocked in at 3:30 - I will have to check. But wow - after a long day at the parks - I don't need another long walk to my villa! Then again - I have sciatica issues...... so I'm not in the best shape. Ms. WDW A DIS Veteran who just won't grow up! Yes; that's the number. We stayed in 3123 a few times. It was the very first DVC trip we made and that was our room. We were fortunate enough to "request" it again on a subsequent trip and got it. Now, that as back in 2000. Don't know if we'd be lucky again!